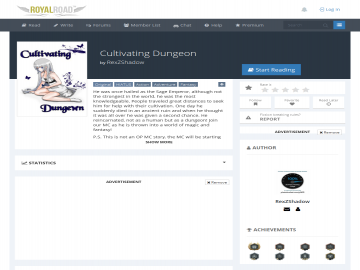 Muse's Success » Web Fiction Listings » Cultivating... Dungeon? "A cultivator reincarnates as a dungeon in a fantasy world." He was once hailed as the Sage Emperor, although not the strongest in the world, he was the most knowledgeable. People traveled great distances to seek him for help with their cultivation. One day he suddenly died in an ancient ruin and when he thought it was all over he was given a second chance. He reincarnated, not as a human but as a dungeon! Join our MC as he is thrown into a world of magic and fantasy! Cultivating... Dungeon? has not been tagged yet. Help others find Cultivating... Dungeon? by tagging it! Cultivating... Dungeon? has not been reviewed yet. Cultivating... Dungeon? has not been recommended yet.